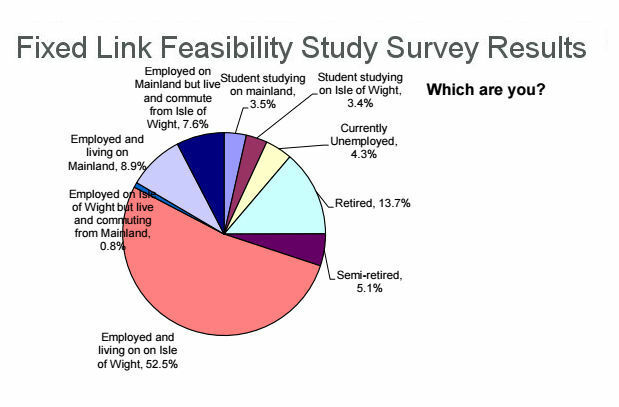 The results of a survey on whether there should be fixed link feasibility study have been released. The survey was commissioned by the Pro-Link group, headed by Carl Feeny and Kevin Price. The data provided revealed that just under 5,000 people – from the Isle of Wight and mainland – completed the Solent Tunnel survey. Of those completing the survey, 77.8% believe that alternatives to existing cross-Solent transport should be investigated. All the raw data has been provided to the media so we have created the tables below to help you make sense of the results. Q3: What is your age group? Q6: Do you believe that alternatives to the existing cross Solent transport should be investigated? Q7: Is it reasonable for IWC to request an independent FL Study? Q8: Rank the factors that should be considered as part of feasibility study. Q10: Is prospect of having a road tunnel “Fixed Link” from the Island to the mainland as positive, or negative to the overall future welfare of the Isle of Wight? Further details can be found in the Report at the bottom of the article. Click on the full screen icon to see the larger version. 109 Comments on "Results of Fixed Link Feasibility Study Survey revealed"
All meaningless. Question 8 was a fix. So of an Island of 130,000, less than 4000 are interested in a feasibility study. How many people put in multiple replies, who knows? Perhaps you should go back to school and learn about statistical significance and representative samples. Too many term-time holidays when you should have been studying, perhaps? No, I was studying Ivan Pavlov. You? And you should stay away from bicycles. People’ll just have to put up with your drooling when they ring their bells, I guess. Yaaaaaaaaawnnn…….. I suppose we are now in for more of “the majority say” propaganda based on the responses of approximately 4% of the population of whom roughly 3% want an “alternative” It’s a fantasy perpetuated by people who have opinions but no facts. Mr Feeney and friends are doing nothing but alienating the Island population with this nonsense which clogs up numerous threads of totally unrelated news. I refer you to my answer to “Colin”. Another one confusing a survey with a referendum. What exactly do they mean by ‘commissioned’? Wasn’t it just a Survey Monkey form they threw together? Are they trying to imply it was a proper study done by an independent company? Also love all the angry stuff that is ALL IN CAPS and highlighted in red. Totally a professional quality document. Needless to say, this ‘study’ is completely worthless. Before I attract the anger of the Mr Feeney and the the Flixers, I of course meant ‘survey’ instead of ‘study’. I do find this whole approach extremely regrettable. Whatever your views on a fixed link, being fronted by such a half-arsed and aggressive (to the point of bullying) group will do no one any favours whatsoever. The results are interesting and informative. They provide information about what the people who knew of, and decided to respond to, the survey feel about the issues. However, are they representative? Market research is backed up by a lot of statistical methodology to cover all sorts of issues – representativeness, question bias, the very many human cognitive biases, and so on. Perhaps it would be best if all those dozy types who can’t see beyond those sort of comments were to go back to sleep whilst the rest of us have an intelligent discussion about what is a very important issue, that of cross Solent connectivity. Show me a data set and I can present that data in many different ways to represent any point of view. You just have to look to Westminster to see this at work. A skewed and pointless peice of smoke and mirrors. Pretty clear that there is an appetite for a fixed link to the IW, despite the vocal opposition of the minority. Errr.. no. there might be an appetite for a feasibility study, which is what this survey was supposed to be about. However it is statistically meaningless and could be completed many times by the same person with even a small amount of technical ability. It is certainly not statistically meaningless. A 4.5% sample of an entire population is quite significant. If you had bothered to read the article, you would have noted that 4356 respondents were IW residents (87.7%) while 611 (12.3%) were mainland residents. The survey *is* credible, and you blindly stating it isn’t has no credence at all. You sound rather like Donald Trump, squealing “fake news” and “fixed” when things don’t go your way. 4% is a statistically significant sample. You admit to trying to rig the survey against a Fixed Link and then, when it turns out that, despite your efforts, the opinion is strongly in favour, you cry “fixed” the other way? When you only get a little over 3% of the Island population responding to this survey it should tell you 97% are not interested. A survey carried out by people who are in favour of a fixed link and heavily promoted on their Facebook group is always going to be biased. The poll carried out at Ryde Academy shows a different story 57% against and 43% for. There were 484 students in Ryde Academy’s sample size done over a week reported in the CP along side their report on Carl Feeney’s study. Isn’t this fixed link supposed to be for our children and their children and from the Ryde Academy’s survey they don’t want one. So you present a survey based on an age range of, what? 11 to 18? And even then 43% were in favour. Seriously? Is that the best you can do? I had nothing what so ever to do with the Ryde Academy’s survey I am only saying things are often not as clear as some (like you) portray. A survey carried out by students with no real agenda is probably more representative than one carried out by the pro group for the pro group after all the person who set the survey is pro link. Sorry, but you are 100% wrong. A survey of 484 11 to 18 year old students is in no way representative of anything other than the views of 11 to 18 year old students. It doesn’t matter how much you twist and turn, the pro-link survey *is* significant. The only thing you can be sure of with statistics is that you’ll never know the truth. Statistics don’t convey truth, just probability. And the probability, with a high degree of confidence, is that more people are in favour of a fixed link than not. Keyboard warriors at it again, if it is meaningless to you why do you continue to negatively comment on anything FL related. If it’s no threat to you then don’t worry about it, and yes there is a alot of people on the island that want a FL despite the survey. And if a FL is built (more likely now) and they don’t like it, they can…. Not to the 80% of those who bothered to express an opinion it isn’t. How about if you don’t want to pay for the ferry you MOVE and give us all some peace and quiet. I would have taken part in the survey if I had known about it. I wonder how many other people were unaware of it? Mason Watch. To reiterate, the ferry traffic already uses the M27, the benefit is not having to cause congestion in Portsmouth and Southampton City centres. Where the new link roads connect to will be a matter for the experts at the DfT to decide so your question is better addressed to them. Let us all know what their response is please. You only have to look at the picture portraying what a fixed link will look like in the IWCP to realise its all irrelevant. What I would like to know, is how far that dual carriage way being portrayed will be progressesing as one here on the Island? Before meeting B and A roads! I’d guess that it will link into the racecourse roundabout at some point, but really this is a question for the DfT. No doubt in a few years time when the link road has been built all these matters will be resolved one way or another. Let’s just build the fixed link and hope for the best when it comes to the extra congestion it will bring, and that it doesn’t bring any negatives to ruin islanders everyday lives. Everyone knows that you can make figures say whatever you like. Until there is a 100% island resident referendum on whether people want a ….. …. the whole survey and this article means nothing. Page 12 of the IWCP, it’s really up there with importance and interest. As it is now obvious that the majority want a fixed link and government infrastructure funds are plentiful the big question is which isolated island are those opposed to a fixed link going to move to? St.Kilda or the Shetlands perhaps? or may be somewhere even more isolated like the Falklands? Have you got a link where those funds are supposedly available? Could you post it on here please. The majority, hmmm, I would say this would make the survey front page news!! I won’t have to move. The majority!, this survey should be front page news on the local rag, and be all over our local radio station then, your stickers should be on nearly every house and car on the Island. I won’t have to move..
Chris, well done for the volunteer bit. I am a pensioner, also 80, luckily healthy, after mailand ops, but still prefer to be here. Have you thought that an improved hospital might cost less than a fixed link? The problem there of course is getting the budget transfer from DoT to NHS – it won’t happen. I remain against a fixed link. The problem is, improvements to the hospital can easily be rolled back in the next round of government cuts. Undigging a tunnel, not so easy. I do not need to take a more active role “in the campaign against an FL”. I do not think such a campaign exists, and there is no need for such a campaign in any case. A fixed link is not necessary, not desirable, and even most certainly not a scheme worthy of investment from whatever source. Others disagree and given the lack of sensible argument on your part, our chances of success are growing by the day! BillyB … I’m wondering … if the ferries are “practical” … why are there so many delays and cancellations … not to mention fires, collapsing mezzanine decks and accidental sewage spillages. All of the above at a time of increasing prices and reduced services. A FL is infinitely more practical than the outdated and unsustainable ferries. PS Billy B … the world has changed a lot since the 1700s! Do you really consider that to be a sensible part of your argument? Then please take a more active role in the campaign against a FL. please go out there and spread the word that the Island does not need a FL because your family have lived here since the 1700s. You will still be wrong. Simple maths and statistics. Not my fault if you don’t understand. We do not need a bridge/tunnel. A bridge/tunnel is not viable. Even if it is, who would be daft enough to fund it? We are an Island; relish it! Less than 5000 people could be bothered to fill in that very dubious survey. If it was that high up in people’s priorities, it would of been front page news. 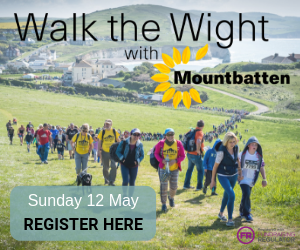 It was a survey and surveys generally do not get a high response … even when people do care … it’s a sample of the population and the organisers have provided the raw data for scrutiny. At this very early stage it’s what would be expected. Interesting that he results reflect the e-petition numbers. Fixing the ferries comes under changing central government policies, that doesn’t come easy or quick. Just like your trying to do with trying to get councillors who are pro fixed link voted in, how is that going by the way? We all have our own views on the best way to solve the problem. Unfortunately, opponents of a FL keep talking about regulation and making the Island a special case but have achieved nothing to that effect. Is there actually any organisation of any form (campaign group or political party or ?) actually working to achieve those goals? When have I said I’m the only one that cares? My alternative suggestions, are there as many negatives involved as with a fixed link? Will feasibility studies be required? I hope to see you encouraging them more in the future. Richard – as previously asked, is there actually any organisation of any form (campaign group or political party or ?) actually working to achieve your alternative suggestions? Can you point me at the “regulate the ferries” petition or FB page for me to support? I’m not aware of any groups. But that does not make my points any less valid. If the fixed link campaign says that a fixed link will improve tourism and the economy, my alternatives offer the same outcome, with in my opinion far less risks. So they should be encouraging them, which I haven’t seen them do. But you won’t support others. No – I said there is nothing to support – if you believe what you’re saying do something about iit and start a campaign for regulation. I already am doing something about it..when I vote at local and general elections. But I think you are missing my point..if all that support a fixed link, stating how it would increase tourism and the economy, they would support any idea that may give them that goal, and take it on board..not just dismiss it, especially when these alternatives carry no risks, and therefore no resistance. I think the fixed link brigade dismiss these alternatives because they are very real alternatives..and they want a fixed link at all costs. Many people do vote, and then things change. The alternatives are there..however much you try and downplay them. And if voting does not change anything…maybe you should try telling that to all the fixed linkers on their website looking for pro fixed linkers candidates for future local councilours. Sorry I should of said that possibly 5000 people say they want billions spent on them…the other 135000 couldn’t care less, or are happy. Try a different approach maybe? Less than 5000 completed a highly dubious survey. Good luck with getting your billions. Again showing your ignorance about how surveys work. Another proponent of the Trump school of fact finding. If you don’t like it call it fake, despite the evidence to the contrary. News for you. It isn’t fake. You are the minority. Suggest you start getting used to it. Very interesting that Ryde Acedemy students voted against a fixed link recently. Good for them.